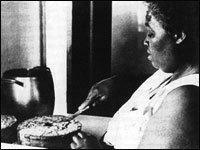 Georgia Gilmore fed the leaders of the civil rights movement. Georgia Gilmore of Montgomery, Alabama, was an unsung hero of the civil rights movement. In Montgomery, Gilmore cooked for Martin Luther King Jr. and other civil rights leaders. She also organized a group known as the Club from Nowhere and sold baked goods to help fund the Montgomery bus boycott. The Kitchen Sisters (Davia Nelson and Nikki Silva) produced a podcast about Gilmore titled "A Secret Civil Rights Kitchen: Georgia Gilmore and the Club from Nowhere." Incoming On Second Thought host Virginia Prescott sat down with the Kitchen Sisters to learn more about Gilmore and her secret kitchen. Incoming On Second Thought host Virginia Prescott speaks with Nikki Silva and Davia Nelson, who produce the Kitchen Sisters podcast. The producer duo will be in Atlanta Monday for the Radiotopia Live East Coast Tour and they're hoping to eat some good fried chicken while in town. Tweet suggestions to them at @kitchensisters.